When the building of Canberra commenced in 1913, walking and horse drawn transport were still the main forms of transport and Queanbeyan was an established settlement adjacent to the new capital city. References to the beginnings of public transport between Queanbeyan and Canberra were reported in The Queanbeyan Age on 11 September 1923 and referred to Mr RF Tetley intending to run a regular motor service between Queanbeyan and Canberra called the “Tetley Motor Service”. 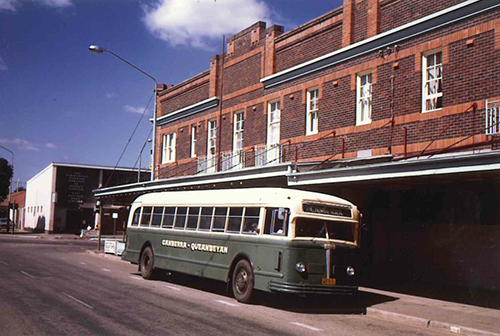 Services were operated on tracks and crude roads linking workers on the development of Canberra with the shops and other commercial opportunities of Queanbeyan. 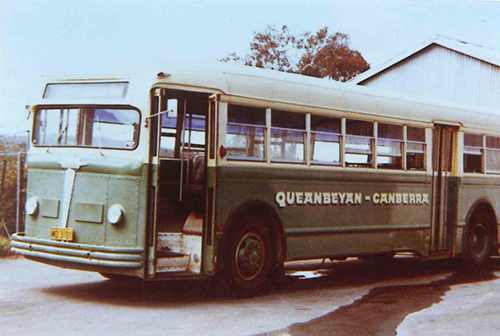 In 1925, reference was made to the Barton family who commenced a service between Queanbeyan and Canberra in 1925. Mrs Barton’s “Safety Coach” service was augmented in 1926 when demand required a second bus to meet capacity. In 1926, a body was established to develop the ACT called The Federal Capital Commission. It unsuccessfully sought tenders to operate buses within the Canberra development precinct and subsequently acquired buses to operate under Government control, the precursor to today’s ACTION transport. In those early days, a service between Queanbeyan and Canberra was also started by a Mr Dawson and, by 1934, there were newspaper reports of tensions between Mrs Barton and Mr Dawson over alleged preference by Council to Mrs Barton in relation to allocation of timetables to the detriment of Mr Dawson. 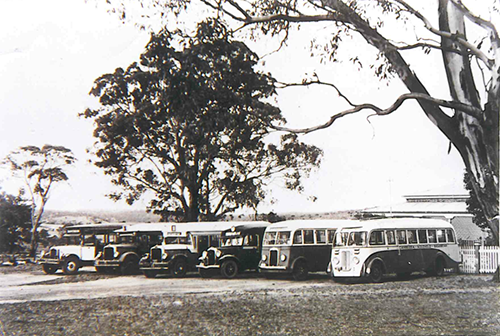 By 1935, there are reports of Barton’s Safety Coach Service being granted permission to reduce fares between Queanbeyan and Canberra to six shillings (weekly) and one and sixpence for the daily fare. In April 1938, The Canberra Times reported the death of Mrs Barton, noting that she had disposed of her interest in the bus service to the Quodling Bros approximately 3 years prior. The Quodling Bros operated the services for over 30 years eventually selling to the Lever family in 1977. 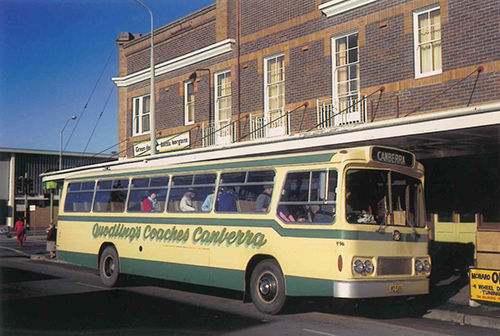 By that time, the business was operating 11 buses on school and route services in the Queanbeyan–Canberra district. The Lever family continued to support the growth of the Queanbeyan district, eventually selling to the Deane family in 1990. 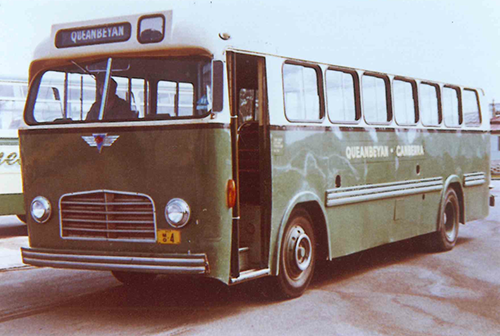 By that time, the business was comprised of approximately 40 vehicles - buses and coaches - serving the Queanbeyan region. 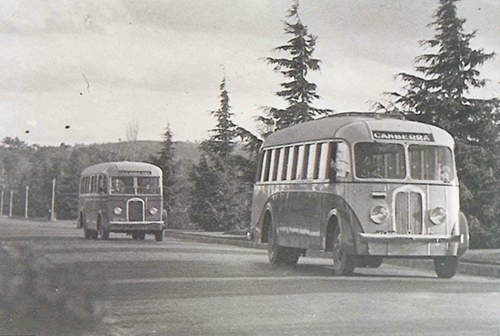 In 1958 Yass, despite some prior connections, was finally linked to Canberra by a regular bus service with the establishment by the Williams family of the “Yass–Canberra Passenger and Freight Service”. This name was subsequently abbreviated to “Yass–Canberra” and, by the early 1980’s, had become the “Transborder” bus company. In 2008, the current business linking the Capital Region and the ACT was formed when Deane’s Bus Lines acquired the “TransborderXpress” business from the Williams family with over 85 buses and coaches connecting the Canberra, Queanbeyan and Yass districts. In 2012, this history of progressive growth continued with the Deane family selling the business to ComfortDelGro Cabcharge (CDC), currently the largest privately owned bus operator in Australia. CDC operates over 1600 buses in NSW and Victoria, predominantly under contract to Government for route and school services. In Sydney and regional NSW, CDC operates bus services through the Hillsbus, Hunter Valley Buses and Blue Mountains Transit brands. In Melbourne and regional Victoria, CDC operates bus services through the CDC Melbourne, CDC Geelong and CDC Ballarat brands. CDC constantly reviews its business to ensure that it is properly positioned to support the needs of communities it services. It is expected that both the Yass and Queanbeyan corridors will continue to experience significant growth in the next 10 to 20 years. 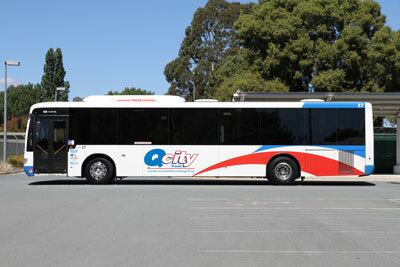 In July 2013, the Deane’s brand was replaced with Qcity Transit, which is better aligned with the local district. The Transborder Express name remained for the Canberra-Yass corridor. At CDC, our commitment to supporting local community needs is at the core of our business values.